It’s that weekly yard chore that you either love or hate: Mowing. It’s amazing how doing this one task properly, or improperly, can impact your lawn’s health. But it’s not just the act of mowing that determines lawn health, it’s how you fertilize before you mow that also makes a big difference. When you fertilize lawns with conventional synthetic fertilizers, the grass grows very quickly as it immediately takes up the nutrients. Add a stint of rainfall to the equation and your grass can quickly get out of control. All that synthetic fertilizer actually means more mowing. By fertilizing organically, you’ll provide the lawn with a stable consistent source of food, enabling the grass to grow at a natural pace. Knowing which type of turf grass you have and how to mow it properly is also important. It’s a common practice to cut turf grass much too short and then bag up all the clippings. Those clippings then typically get left out in bags for the city landfill. Problem is, all that extra mowing and bagging you’re doing is actually hurting the lawn and the environment. You never want to mow your grass more than 1/3 of the existing grass blade. When you do, it shocks the plant, especially when it’s hot outside. Cutting your grass too short reduces water retention, meaning you’ll have to water more. Plus, when plants are in stress, they attract more pests and diseases. Suddenly, all that extra mowing seems like just an invitation for more work. 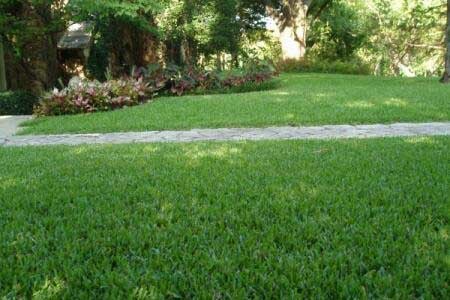 Bermuda grass should be mowed to 1 ½” to 1 ¾” , St. Augustine can be mowed to 3-3 ½ ” tall and Tiff mowed to 1” tall. Grass at this height will absorb more sunlight, retain more water and shade out potential weeds. It’s also best to leave the clippings on the lawn, instead of bagging them. Now, don’t leave big clumps of clippings. If you’re mowing properly, only removing 1/3 or less of the blade, and only mowing when it’s dry, then the clippings should naturally disperse into the lawn. These clippings will decompose quickly when consumed by beneficial bacteria, which turn the clippings into food for the lawn. Plus, you’ll be keeping that valuable carbon matter out of the landfill! And by the way, lawn clippings don’t cause thatch.